Somehow Friday, Sat. & Sunday got away from TPP. Friday was pretty springy and TPP even planted some parsley seedlings, and luckily put them under some protection. Saturday was a horrible weather day, starting with sleety rain, that turned to snow, heavy wet snow, and then finally to some substantially heavy snow. Oh, TPP has seen & experienced much worse, but for this area this was impressive and thankfully brief, but still the storm put a good 6 inches on the ground. TPP's first thought was swell, this cleanup job can wait a couple of days and warmer weather will remove the snow, but people were coming to din-dins, so sidewalks and drive needed some clearing. An overwhelmed little snow thrower actually helped move most of the lighter snow that was sitting atop the base of icy slush, that froze once exposed. Fortunately TPP had some experienced help, a French Canadian guest, who while now living outside the reach of the snow gods, still remembered how to shovel. Some of the things in bloom will probably have gotten crushed by the heavy precip. but fully expect the extremely tough hellebores to take this in stride. Although they may be a bit more noddy than usual. 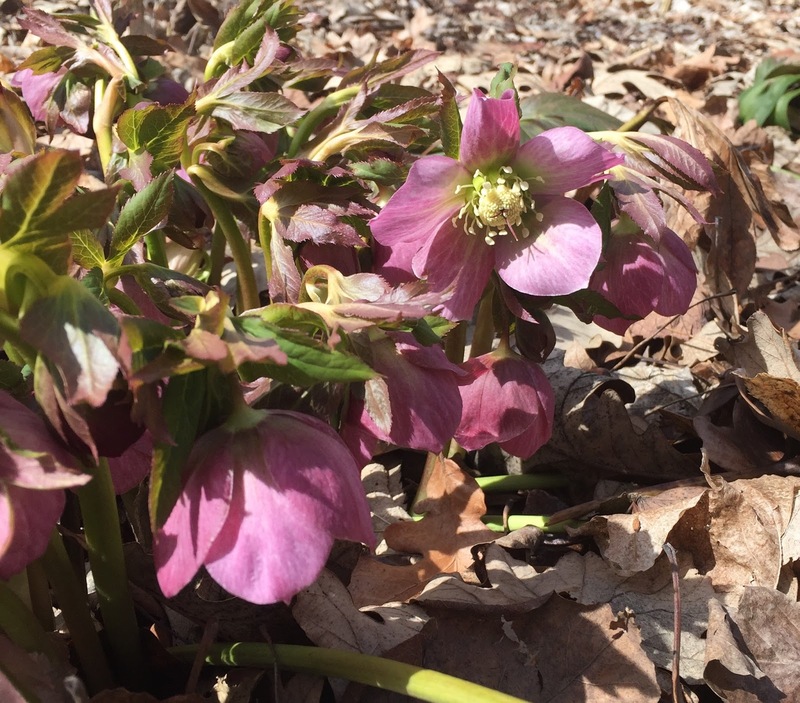 One problem with the common hybrid hellebores is that they tend to hold their flowers in a nodding or pendent position and the heavy slush may push them down further. So here's what hellebores looked like before getting smushed under slush. The cold & snow won't bother them.